Louise A., of Longview, Washington, had a mystery on her hands. A dedicated genealogist, she had been tracing her family history and building her family tree—but had hit a brick wall. There was a 100-year-old mystery in her family history that she couldn’t solve in her genealogy research: what had ever happened to her long lost great-uncle, Fred Day? Louise wrote to GenealogyBank describing her research frustration—and her exciting genealogy breakthrough. A note to give you a BIG “thank you” for your service! I had searched off and on for eight years trying to solve the 100-year-old mystery in my family of a great uncle that disappeared while fishing along the Columbia River in Oregon, or so the story went. In all the searching in local and state archives, plus checking with records offices anywhere I could think of, the ONLY record I found was a certificate of marriage, to my great aunt in 1909. Eight frustrating years of research, and no answers. The family story Louise heard as a child had always been vague, about some “fishing accident” involving her great-uncle Fred, but never any details. Then one day Louise turned to GenealogyBank’s Historical Newspaper Archives, figuring that in a collection of more than 6,500 newspapers and over one billion records, there was sure to be something she could find out about her great-uncle. She found articles about a Fred Day, all right, but not the Fred Day who was her great-uncle. Then an idea hit her. The other day I happened to think to put in my great-aunt’s name, “Bertha Day.” Bingo! 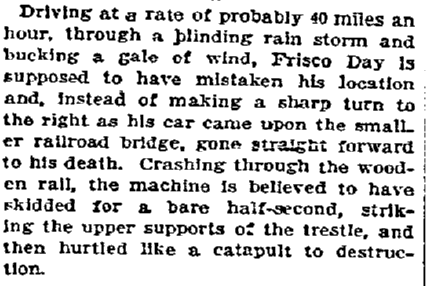 Here came article after article of the disappearance of “Frisco” Day in 1910! I could barely believe my eyes! 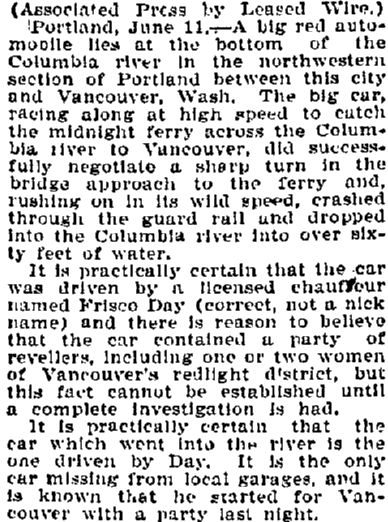 He did not disappear while fishing, but disappeared by driving drunk as a chauffeur, taking a woman to catch a ferry late at night, and ran off a trestle into the Columbia River slough! 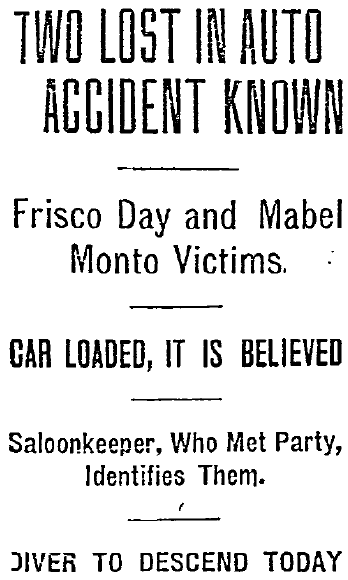 The headlines of the next news article speculate that Louise’s great-uncle Fred “Frisco” Day and a woman—Mabel Monto—were the victims of the car crash. 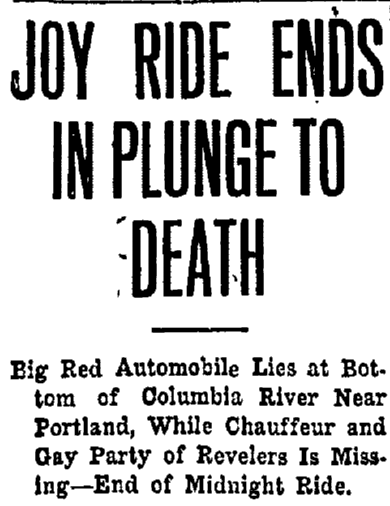 Although the bodies had not yet been recovered, a Portland saloonkeeper, Tice Adkins, served the couple drinks and saw them get into the red car and drive off into the pouring rain. That same newspaper had another article about Frisco Day’s accident. He [Frisco Day] was expected to return on Friday night at a late hour, and even before hearing of the accident, Mrs. Day had become much worried over the non-appearance of her husband. When she was informed that her husband might have been one of the party which met a tragic death she was prostrated with grief. She remained downtown with friends hoping against hope as clue after clue was followed out, each pointing more strongly than the other to her husband as one of the probable victims. 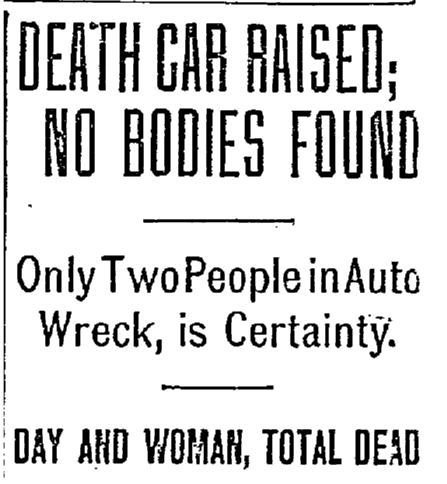 The next day’s newspaper reports that the car was recovered but no bodies found. However, police investigations confirmed that Day and Monto were the only two people in the car, and that both certainly drowned in the accident. Thanks to these old newspaper articles, Louse found out what happened to her great-uncle Frisco Day all those years ago, finally breaking through the brick wall that had her stumped in her genealogy research. But since his body had not been recovered, she still lacked closure—and kept searching through the newspaper archives to see if she could discover more. 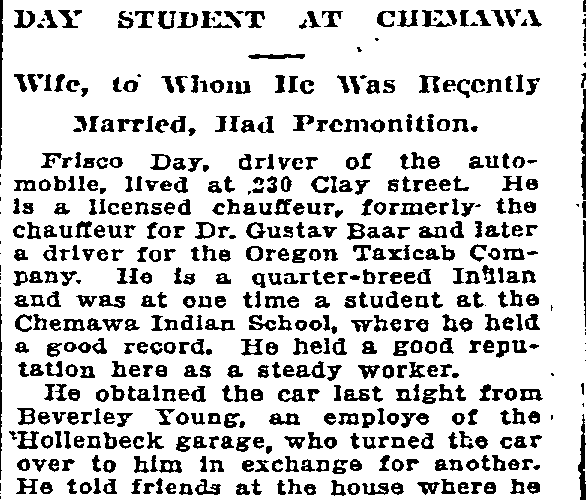 Then she found what she was looking for—this newspaper article, reporting that his body was finally recovered in 1913, nearly three years after he was killed in the accident. The skeleton, which was identified by letters in his pockets, was taken to Portland. 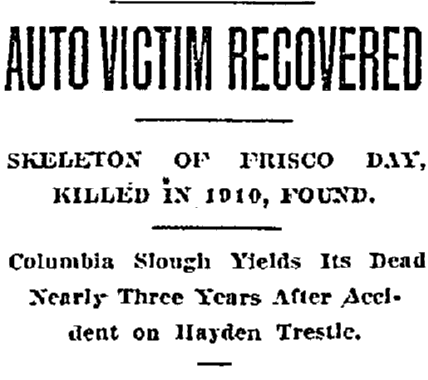 The papers had the final story of finding his body almost three years later, in 1913. What a scandal it must have been and my great-aunt had only been married to him for a few months. It was absolutely fascinating to read all these stories and finally solve this mystery! I know without these newspapers being available, I never would have known what happened to him and why he was never mentioned while my great-aunt was living. Again, thank you for this service! Genealogy Search Tips: We thank Louise for sharing her family story with us and our readers. Her genealogy brick wall breakthrough presents some helpful family history lessons. Always include old newspapers in your family history searches. Louise spent years searching local and state archives, but government records don’t have all the information—sometimes, the only place you’ll find the true story of what actually happened to your ancestor is in the pages of an old newspaper. Try searching on different variations of your ancestor’s name in the newspaper archives, including initials and nicknames. Also, try searching for the names of close relatives. In this case, her search for Fred Day came up empty—but if she had searched on his nickname “Frisco” she would have found him right away. The key to her research success was searching on the name of Fred’s wife, Bertha Day. Don’t limit your initial ancestor search geographically—cast a wide net. 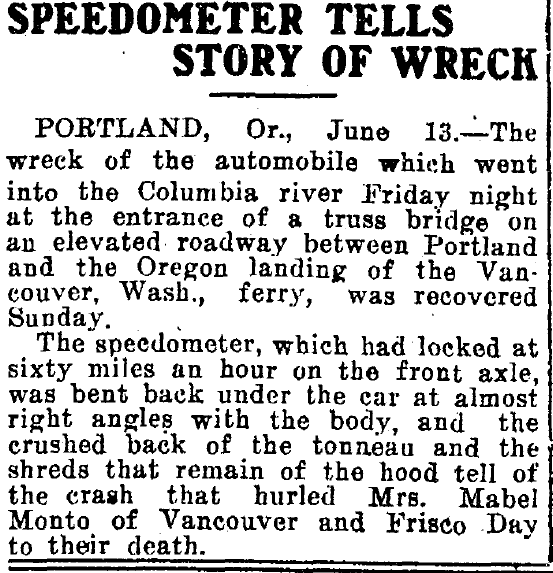 Although Frisco Day’s accident on the Columbia River was a local Oregon/Washington story, newspapers as far away as California, Utah and Florida picked up the news story. Be persistent. Louise had tried to unravel the mystery of her great-uncle’s disappearance for eight years before busting through her brick wall. What a good feeling—to finally fill in a missing piece of your family tree, a satisfying reward after much patient ancestor searching! Congratulations to Louise on finding the story of her long lost relative! It was this exciting story of Mabel Monto and Frisco Day that led me to join Genealogy Bank. I am a playwright researching the father of Frisco Day, and I had been hitting mostly dead ends until a helpful librarian found a couple of news articles for me. Through Genealogy Bank, I have learned an immense amount of information about Robert Thompson Day, including an Oregonian story that has Day’s biography! Thank you so much for this site! Thank you for your comment, Leslie. I’m very glad to hear that GenealogyBank’s newspapers provided you with helpful information about your family history!